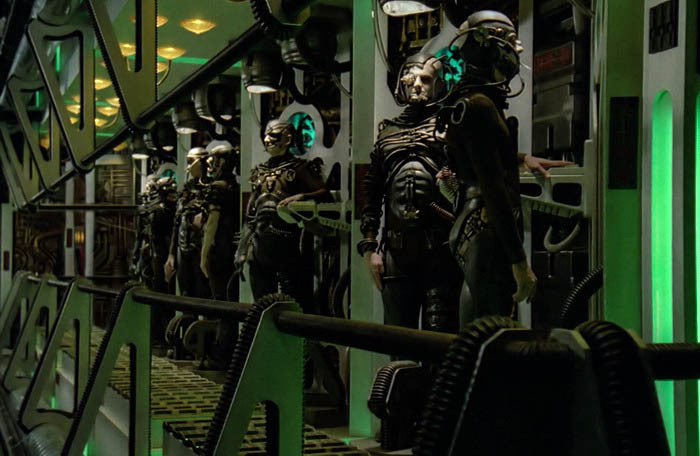 In the Star Trek franchise, the Borg are a hive mind formed of numerous species that have been assimilated into the Collective by cybernetic alteration. They are powerful, unrelenting, and thorough. Like the SJWs of the Left, the Borg tell you who they are. Prior to subjugating non-Borg, they make an announcement: We are the Borg. Lower your shields and surrender your ships. We will add your biological and technological distinctiveness to our own. Your culture will adapt to service us. Resistance is futile. Like SJWs, the Borg value diversity… after it has been conquered and assimilated to serve the movement. Like SJWs, the Borg do not value or tolerate individual thought. Like SJWs, the Borg appetite for assimilation is endless. Like SJWs, the Borg are utterly certain of the correctness of their course of action. Consider the following exchange; doesn’t the smug, sanctimony of the Borg Queen resonate with every SJW zealot? Seven of Nine: 300,000 individuals have been transformed into drones. Should they be congratulated as well? Borg Queen: They should be. They’ve left behind their trivial, selfish lives, and they’ve been reborn with a greater purpose. We’ve delivered them from chaos into order. Like the Borg, SJWs know the right way to do everything. If you do not conform, you must be made to conform…for your own good and the good of the Collective. This applies to all facets of life, even dating. You might think your love life is your business, but the same people bellyaching to get government out of their bedroom disagree. As evidence, PHYS ORG published an article, ‘Redesign dating apps to lessen racial bias, study recommends,’ which says your dating preferences are flawed and it is the Borg Queen’s duty to save you from your preferences. Get that? You shouldn’t be allowed to filter searches if your preferences do not serve the Collective. Get that? Intimacy is very private, BUT the needs of the collective outweigh that. You can have all the privacy you want… as long as it is sanctioned. In addition to rethinking the way searches are conducted, posting policies or messages encouraging a more inclusive environment, or explicitly prohibiting certain language, could decrease bias against users from any marginalized group. You are wrong for dating differently than *they* wish. Now, lower your defenses and prepare to be assimilated. Resistance is futile. SJW’s are the new NAZI’s.